What’s it like to be related to the Royal family? Well, Kate Middleton’s brother James just opened up about it and revealed he’s closer to his family now more than ever, despite all the new fame having a royal sister has brought them. 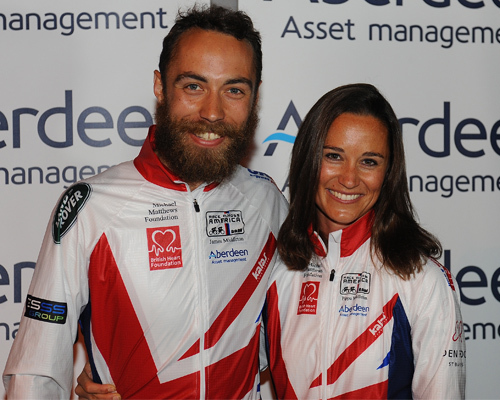 James Middleton, is the youngest of the Middleton kids, and in a rare interview with Daily Mail he is opening up about what it’s like having a sister as a Duchess and what his family life is like now that they’re all in the spotlight as a part of the royal family. In the beginning, Middleton, who is the owner of the personalized marshmallow company, Boomf, explained that even though he might be the younger brother to Kate and Pippa, he has always been very protective of them both, which was definitley the case when Kate started dating Prince William. "I used to be first up in the morning to make sure I could get to the papers and rip out any stories about my sister, so nobody would see them and there would be no conversations about them," Middleton explained to the Daily Mail. As the hype around his sister’s relationship grew, he recalled seeing a slow progression of change in how their entire family was being seen by the public. "It was a gradual progression. Of course, there was a sense of, 'Oh my God, things are changing,' and 'Why are so many people interested in us?'" he said. Eventually, the whole family understood what their new lives as relatives to the royals would be like and Middleton is happy to report that they are stronger now that the Duke and Duchess are married. "As a family, I don't think there is any particular 'policy' on [handling it]," he admitted. "But I suppose it's about respect, respecting the position we are in. It's making sure you don't overstep the mark." "These aren't rules that are written out. It is a general understanding. The fact that you get times when [our lives are] broadcast to everybody brings us closer together," he added. Sure, being part of the royal family wouldn’t be all glitz and glam, but we’re pretty sure it would be fabulous!